Mixing classic and modern design elements, these invitation suites offer a stylish peek at the celebration to come. 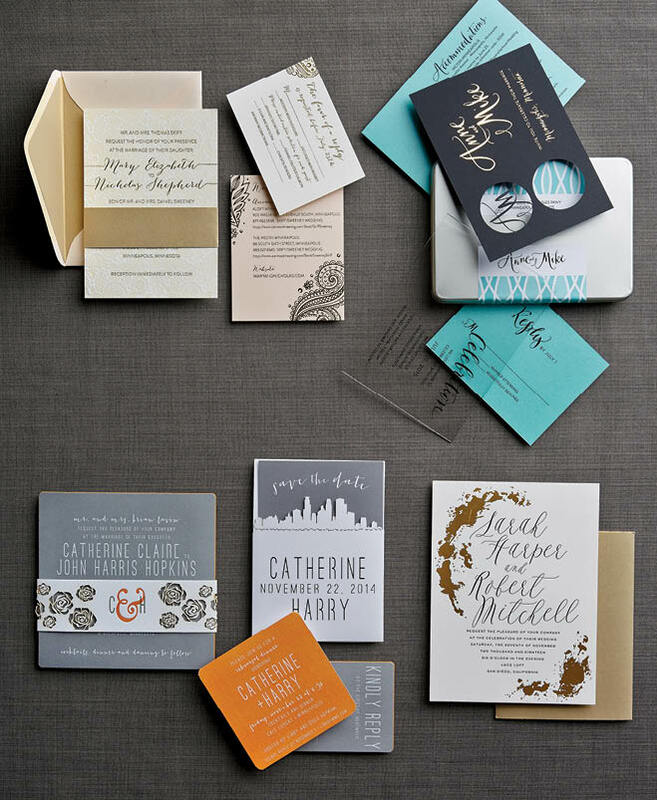 Pairing the old with the new, this invitation suite proves that opposites definitely attract. Katie Murphy Stationery designed a suite combining classical elements with modern tastes, like the interplay of scripted text with a clean sans-serif font. A debossed background pattern, mirroring wedding-gown lace, adds a vintage feel, while gold-foil text and shimmering cardstock will have guests swooning. Home is where the heart is. This invitation suite, designed by A Milestone Paper Co., was inspired by a nearlywed couple’s love of their new home in the city. Using a variety of printing methods and materials—black cardstock with matte gold foil, clear acrylic and bright turquoise paper—this suite carries an eclectic, urban, luxe vibe. The custom hand-lettering comes courtesy of calligrapher Rosann Konieczy, adding an elegant feel. All the pieces find their home in a modern silver tin wrapped with a graphic label. Balancing feminine and masculine sensibilities, this suite perfectly mixes contemporary colors and clean fonts, to simple, effortless effect. The invitation’s cotton stock is flooded with gray ink, topped with white foil and edged with vibrant orange for a pop of color. The save-the-date highlights the fresh, not-so-fussy feel with a laser-cut Minneapolis skyline. A laser-cut floral bellyband, matching a wedding dress, holds the suite together and adds a romantic, whimsical touch. Designed by Gretchen Berry Design Co. This Watermark Stationery invitation is a modern gem. Abstract gold foil details the perimeter for a glamorous accent. Oversized, elegantly scripted names are paired with sans-serif letterpress text for a perfect balance of sophisticated and playful aesthetics. The invitation arrives in a metallic gold envelope, ensuring your guests will find treasure in their mailboxes. In the digital age, hand-lettering imbues your wedding stationery with a unique warmth and a grand sense of occasion.